Day 3 of Europe’s longest running tournament, the PaddyPowerPoker.com Irish Open saw plenty of action as 55 players became 9. With so many big names and pros in the field at start of play, the final table looked likely to be a cracker. As hopes were dashed and players such as title holders Noel Furlong and Marty Smyth hit the rail, things got really intense. Spectators gathered to see if their favorite players were going to make it but for many it was an agonizing day as last woman standing Lorna Lancaster hit the rail in 12th place for a payday of €19,400. She qualified online for $20 and was followed all the way by her friends and family in Canada and all over the world. Elsewhere in Dublin’s Burlington Hotel there are many side events taking place. 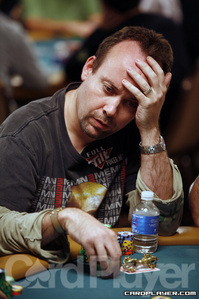 Casey Kastle took down the €750 Omaha event and other events will wrap up later today. Catch all the final-table action throughout the day via the live feed and blog, and check back here tomorrow for a recap of all the action when we will have a brand new Irish Open champion. Tags: Irish Open 2011, Andy Black, Jude Ainsworth, Marty Smyth, Niall Smyth, Surinder Sunar, John Eames, Rob Taylor.